It is finally done! At least phase one is. 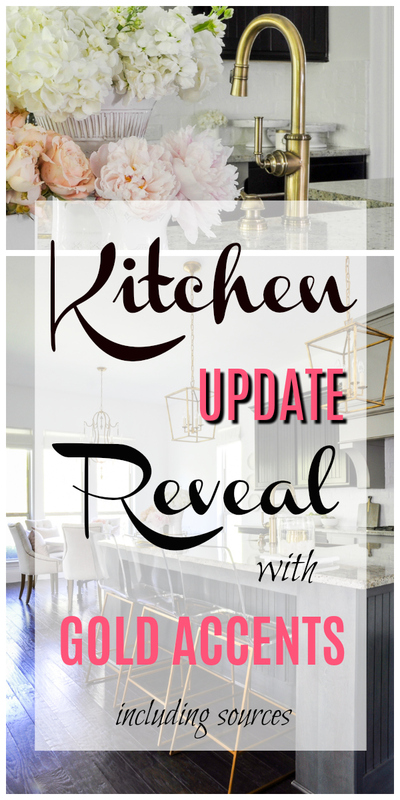 Our kitchen update has been something I’ve been sort of planning in my mind for a while. At some point down the road, I have a list of additional changes I may choose to make, but for now, I’m loving the space again. Below is the look before the kitchen update was completed. And here is our completed kitchen update! I started with new pendants and I love them! They stand out so much more than the ones I replaced. I also changed my barstools. I’ve wanted to change them for a while. When I saw these, I knew they were the ones! They’re lucite with an antique gold finish on the frame. The gold color could not be more perfect with my other updates. They are by one of my favorite brands, Gabby. I just can’t stay away from their beautiful, transitional pieces! The next find, this stunner! To say I’m obsessed would be an understatement! It is a new kitchen faucet designed by Newport Brass as is the matching soap dispenser. The day it was installed, everything came together. I’m just so thrilled with the amazing quality. The final update was our backsplash. It is brick and was applied during the construction of our home. 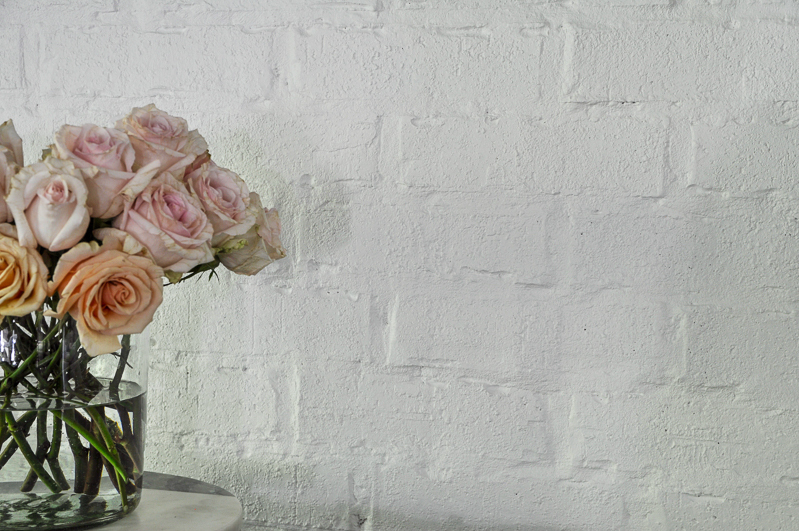 I simply chose to paint it white for a cleaner, brighter look. I will share the details of the process soon, but here is a closeup. Just these four changes made such a big difference! I have done several full-room makeovers lately, so it was wonderful to be able to change four things and have a fresh new look. As I mentioned above, additional changes may follow, but for now, this update is just what our kitchen needed. 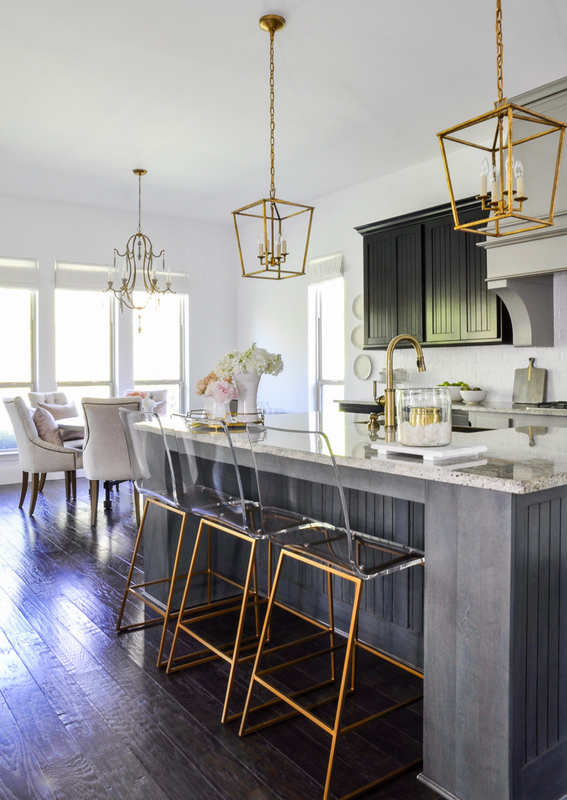 If you have a room that needs an update, but the timing isn’t right for a full makeover, I hope you will try making small changes. 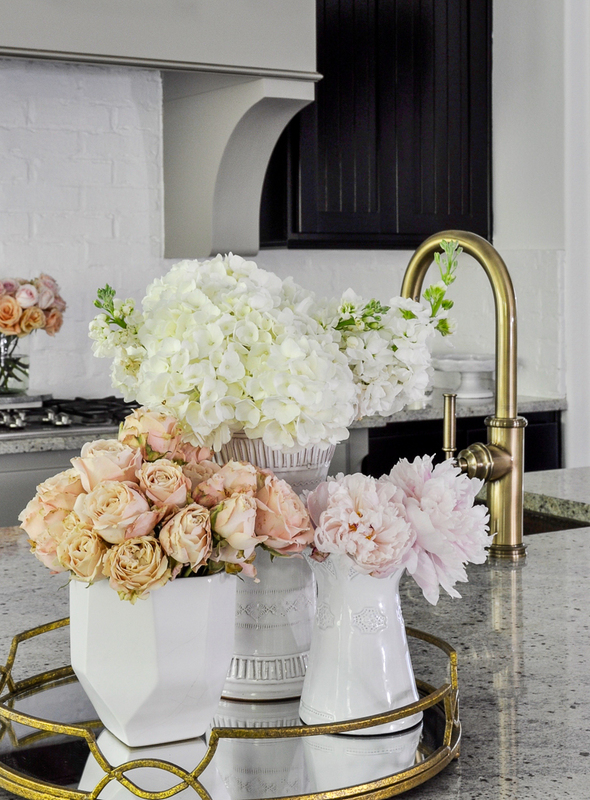 As illustrated here with my kitchen update, you may be surprised at how easy it is to give your home a fresh new look! Update: Phase 2 will be revealed soon and will include freshly painted cabinets, hardware, and more!! The project details and progress have me very excited! Gorgeous!! I adore gold tones and love the changes you made. 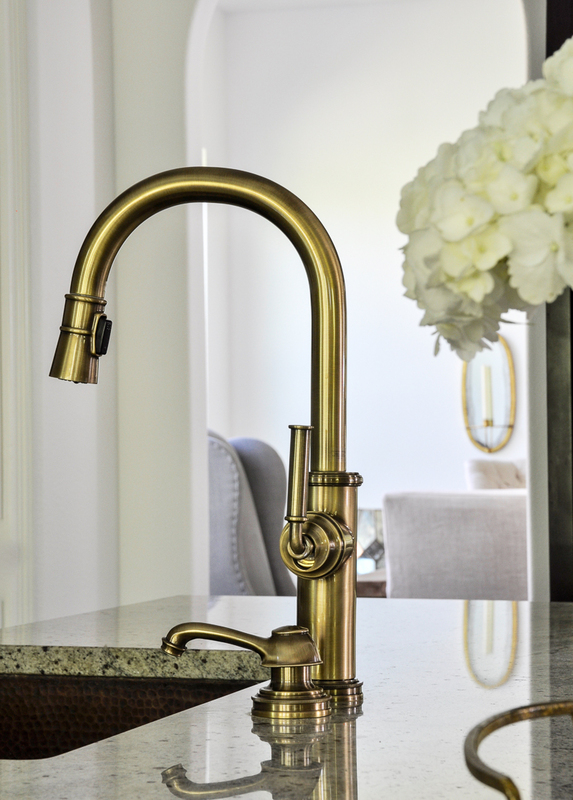 Would you mind sharing which finish is your faucet… aged brass or antique brass? I am sorry I am just now seeing your question. The finish on my faucet is antique brass. Can I ask why you chose not to put hardware on your cabinets? They don’t seem like the kind that could easily open without knobs and pulls. I’ve been seeing more and more WHITE cabinets with no hardware on them on makeover shows and I cringe at the thought of all the dirty fingerprints ending up on the nice white cabinets. Hello and thanks for your question. Hardware was not included from our builder when we purchased the home. Rather than pay extra for the hardware that our builder offered as an upgrade, we elected to add it later. We never actually got around to adding it, but our cabinets are very easy to open and I haven’t had an issue with fingerprint smudges. For the next phase of our kitchen makeover, we may decide to add hardware. Thank you so much! Painting the brick sure did change it. So glad I did it! Can’t wait to see your new house! Beautiful! I enjoy reading your posts and always find inspiration for our home. 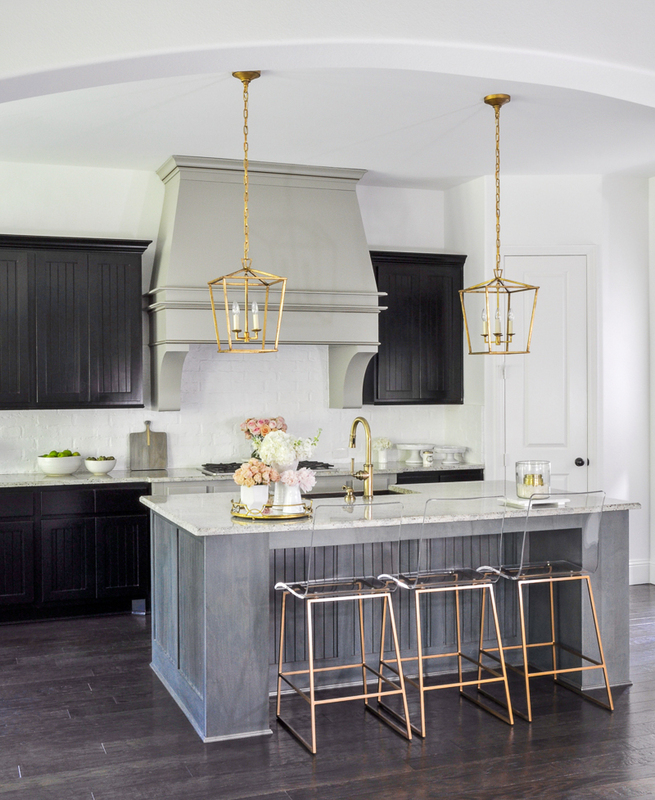 My style is a bit more vintage – like your original look – but I love the warmth and sparkle that a few gold touches bring into the space. Those bar stools are fab! Jen woo hoo!!!! Everything looks so amazing! It’s crazy what a little paint can do!!!! 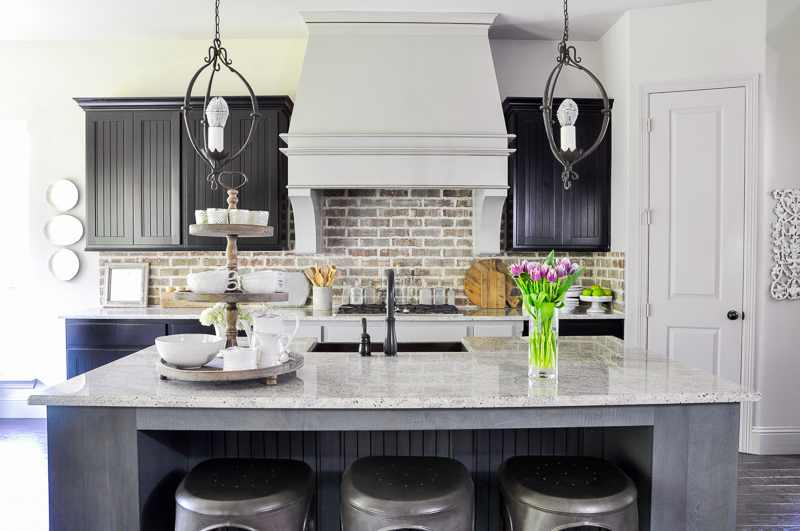 I love how the barstools and lights give the room an updated feel and add a pop! It’s beautoful!!!!! Thank you so much Randi and sorry I missed your sweet comment until now! I am so excited about the warmth the brass stools and lights added. Can’t wait to complete the next phase! Those four changes made a huge difference. It now fits better with the rest of your home. 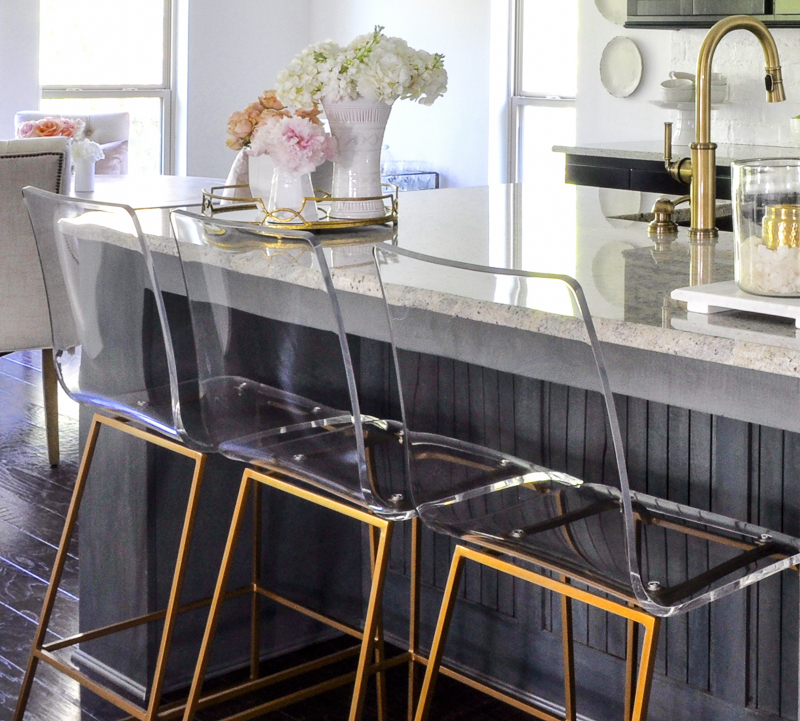 I love all the gold touches, especially the stools. It’s elegant and beautiful! Amazing what just a few changes can make. I liked it before but the painted brick was a game changer. Beautiful with the gold accents too! Thank you Sandy! I was even surprised by the change the white painted brick made! Love it! I went straight to the website and snagged that gold tray. I neeeed those barstools, but at a lower price point, the hunt begins. 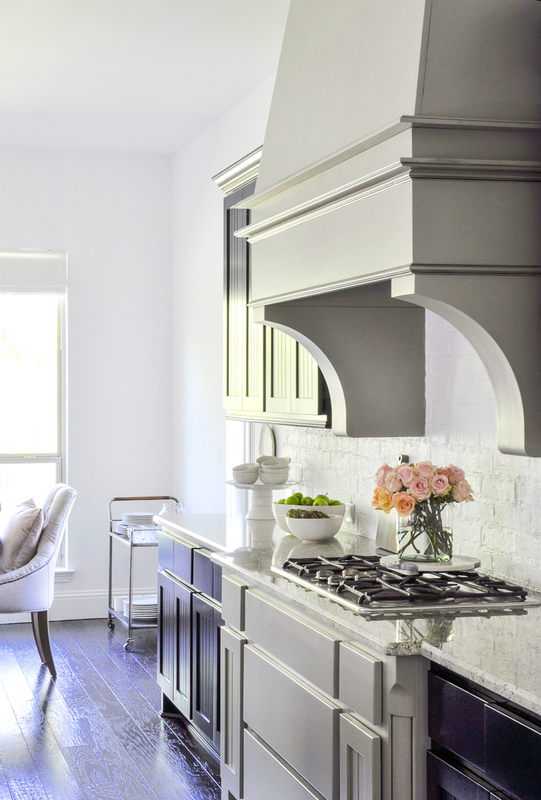 I’m thinking of making very same changes to freshen up my white cabinets. But I see you don’t have handles on your cabinets. Is that true? If so, do you recommend I replace my silver with gold ones or would that be overkill? Hi Jena! Sorry I am just seeing your comment! I didn’t have knob or pulls, but since this update, we have added them. I adore brass/gold ones and they are certainly current. Some of the new ones I selected are brass and some are lucite with brass accents. Hope this helps! Jen this is such a gorgeous transformation! 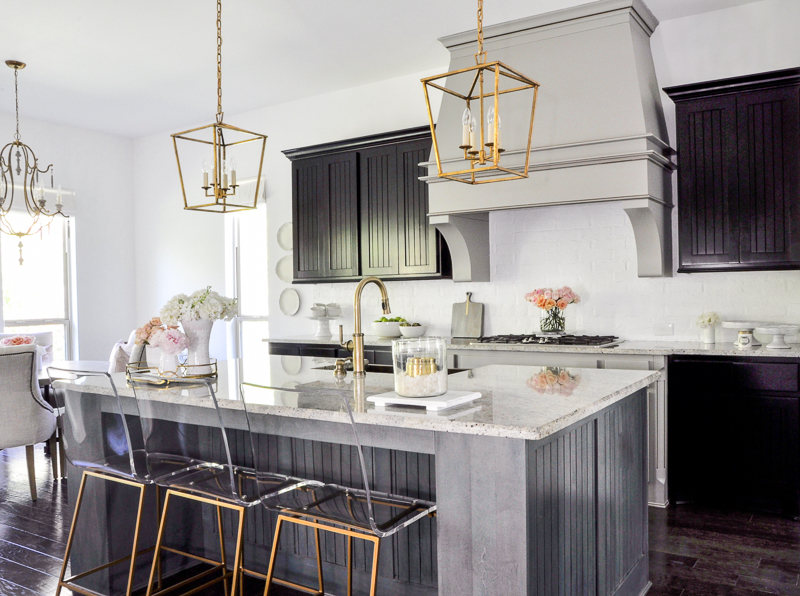 I love how the brass on the barstools brings in the brass on the faucet and lighting. It gives it such a glam touch! Thank you Rebekah! 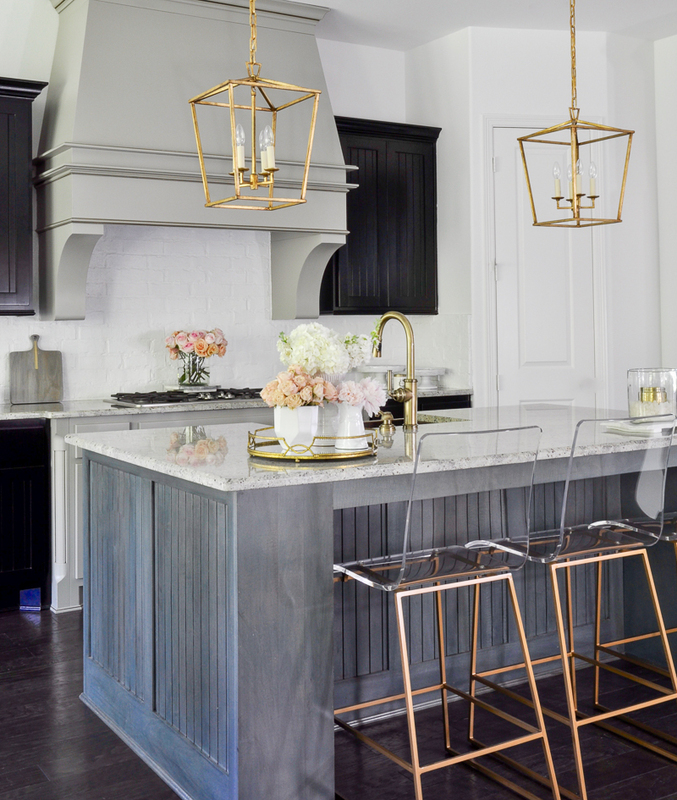 I am loving the new brass accents and can’t wait to finish Phase 2 of this makeover! Jen I’m loving all of your kitchen updates! You’ve done a great job transforming the space with just a few changes. 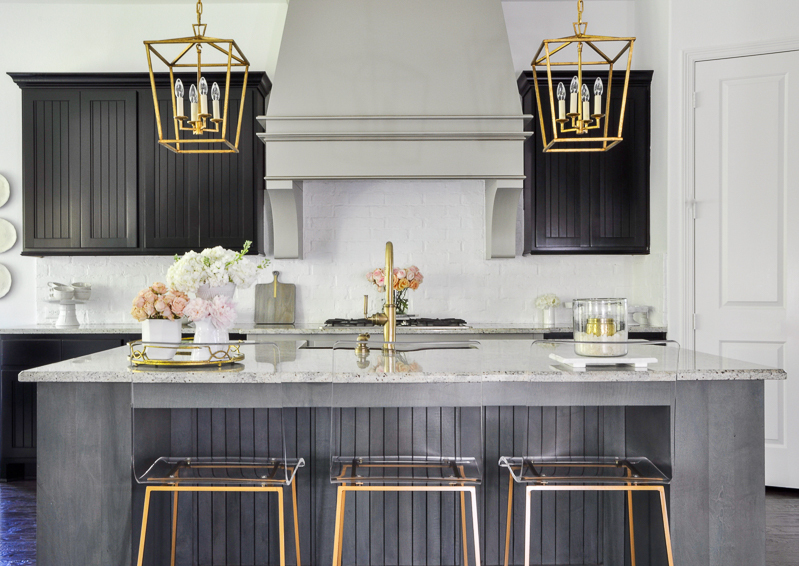 Love the gold brass touches, they really pop and add a touch of glam! Thank you so much Kim! I’m so excited about the new brass additions! 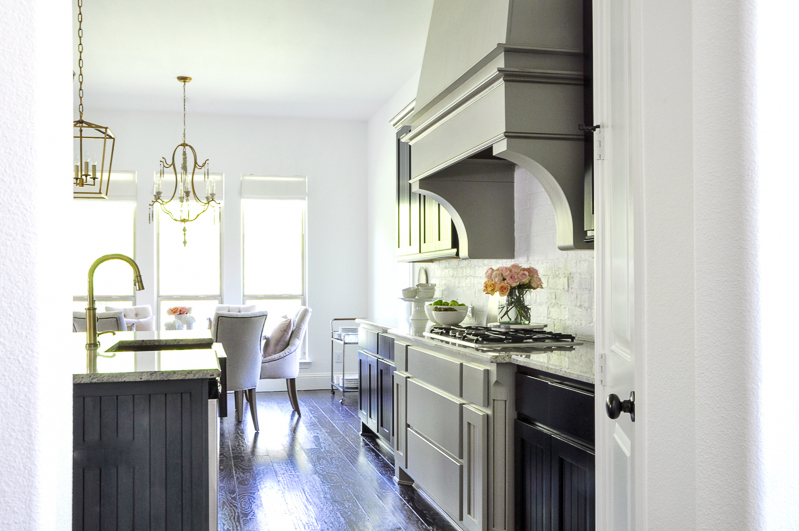 Can you please share the color of your dark grey cabinets? Thank you!! Obsessed with your kitchen. Hi Lindsey! The cabinets were an option through our builder. They were not job-built, so I don’t have a color. Sorry! So beautiful! 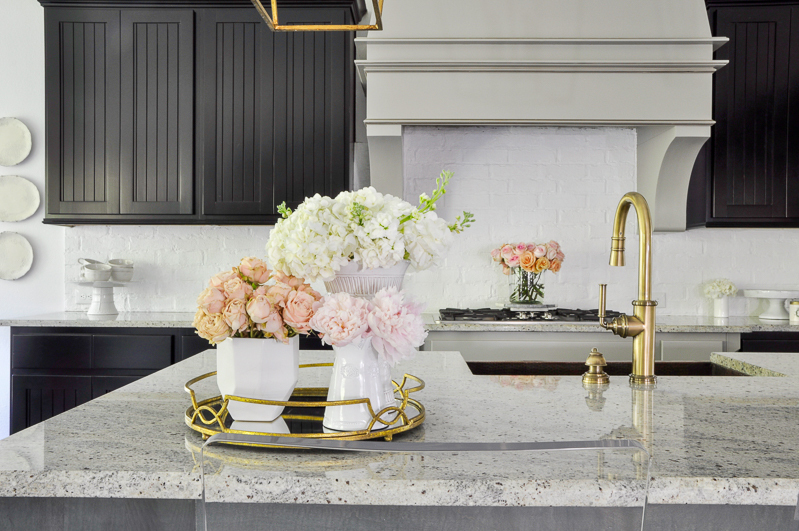 Would you mind sharing the name of your granite countertops? They are gorgeous!! Hi! I’m building a house and have looked at what seems to be thousands of pendants/chandeliers for the island and over the kitchen table. The gold redo looks awesome, but I really loved the pendants you had prior to the makeover. Do you have any idea where they were purchased? They look sort of french country – oval/three rings with one light bulb in the center. Any info you can provide would be greatly appreciated! Hi Dawn! They have been discontinued. We still have the ones we took down from our kitchen. I’m not sure if you are interested, but they are going to be listed for sale soon. 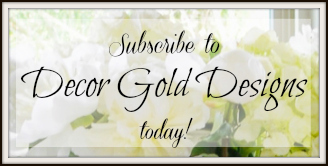 You can email business.decorgolddesigns@gmail.com for more information. Hope this helps! It looks beautiful. I love the barstools. …and the Roomba vac advertisement too!! I think I am going to purchase one. there weren’t too many reviews but those that I read were very positive. Do you have one? If so can you share your thoughts on it?